Let me just say that I am a fan of your work and have been for over a decade. Which makes it a little frustrating that you haven’t finished the story from the comics after issue 36. 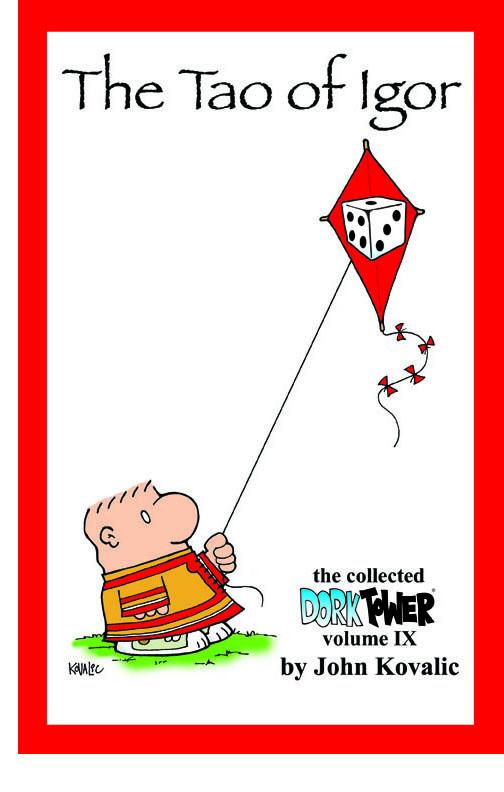 I mean the last issue has content for the old Kobolds Ate My Baby which just got a whole new edition! (with awesome art btw). In your FAQ on the website you say that you know how the story between Matt and Gilly will end and when, but what about the story with Igor and Bill. Or the story with Ken & Sujata? would it be so horrible to finish that story for those of us who have been waiting for years to see it. I don’t mind where and how you finish. I’d pay for a downloadable black and white PDF at this point. I just want to know how it ends. I remember a while back you posting in your blog that you were working on it again, but I haven’t seen anything about it since. Did you decide it is over already? Is it a lady and the tiger sort of thing? I know you are very busy with a lot of projects being juggled not to mention a family. As the father of a 16 month old girl who also went through the “paper Pregnancy” known as adoption, I believe I can appreciate that more than some. however, please know that some of us haven’t forgotten that story, and are still eagerly, albeit patiently waiting for it’s conclusion. At this point I’d just like to know if one of those projects being juggled is the completion of that story line? If it never will be concluded, I can respect that, but please give me (and I’m sure others) some closure by telling us that. And if I missed where you said that in a blog post somewhere I sincerely apologize and would love a link. Thank you for all your awesome work, the laughs and being a voice of integrity and source of pride for the gaming community. I love everything you do. If I didn’t you wouldn’t be getting this letter. Trust me on this one – I really understand your frustration. I’m not sure I ever blogged fully about the specific reasons why I went on hiatus from the comic book when I did, but I certainly didn’t expect the pause to last six years. To the chase, though: yes, one of those projects IS the one that you are hoping for. I don’t want to talk about the Project That Shall Not be Named too much until it’s done and ready to go to press – mostly because I’ve blabbed about it before in the past, and things have fallen through. I hope there’s big news on the Project That Shall Not be Named soon! SOON! And if it’s successful, there might be more…you know…similar projects! Also, once the Project That Shall Not be Named is out there, the relationships in the online comic strip will change, as well. I’d love to say more, but I’ll wait until the Project That Shall Not be Named is closer to the finish line. It’s close now, but hope it will be a lot closer soon. But I don’t want to jinx anything. Thank you for your years of support, but also for your patience! At the moment Gilly is in Pittsburgh. I’ve not explicitly why she’s there, in the online strip. A couple of years ago, she mentioned she was leaving London, and I thought it would be a bit silly still drawing her there. Pittsburgh seemed like a nice halfway point on her journey home. It’s a great city, and anyway, I have family there, so I thought it might be fun to draw. Not that I’ve drawn it yet. Wednesday’s strip wasn’t supposed to be a slam on Steelers fans, but on #FakeSportsBros. I figured a #FakeSportsBro would wear a local jersey, even though at most he could name three or possibly four players on the team. 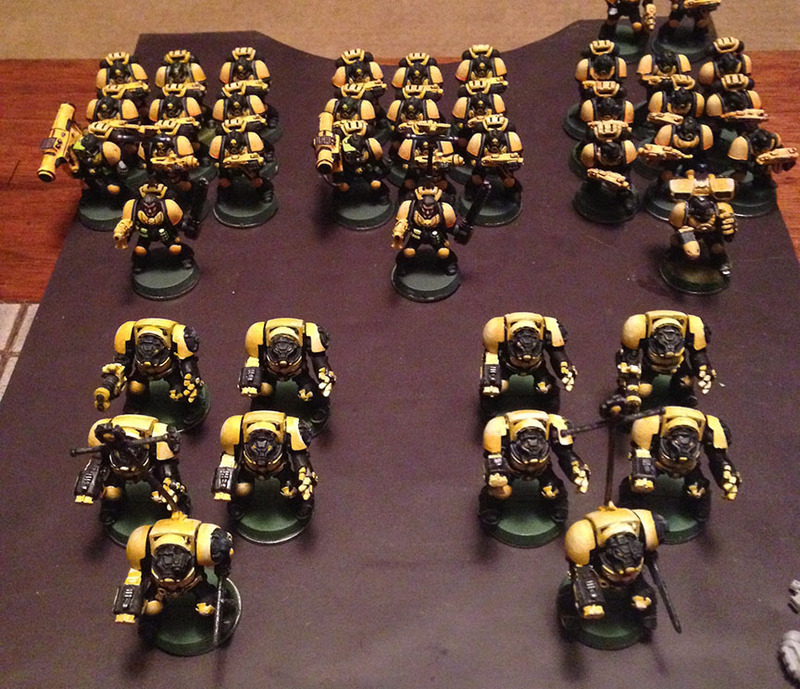 Anyway, lest anyone doubt my Steeler’s fandom, here are the Warhammer 40K Space Marines I’ve been basing, recently. 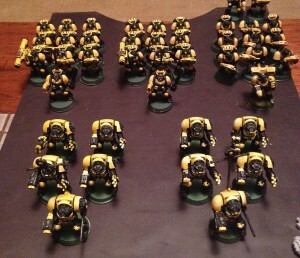 Fear not, Wisconsin readers – Warhammer Fantasy Empire Army is resplendent in Green Bay Packers colors.